So here is an attempt to be a man of my word. Well, work is severely under way to get the Laish album actually released. You know, available to buy in shops and online and downloadable and bonus material and press and tours and artwork and photos and so on until my head hurts. It’s all going well. We think. The album, despite various attempts at giving the album a title, is simply called Laish. Self titled if you will. An introduction perhaps. The release date we are aiming for is 15th November though we’ll no doubt be doing pre-orders soon and if you’re lucky enough to catch us live and we have some with us then you can buy one from our own hands. Not yet though. More to do. Why am I even writing this? I should probably be posing for a press shot or taking an NME journalist out for lunch. We have album launches in London and Brighton in November. And we will be playing new songs which will probably be appearing on a new EP at some point sooner rather than later. Stanmer House on Sunday. Yes Laura Marling is headlining in case you hadn’t noticed. Our Marcus from Sons of Noel is playing (of all things) banjo for her band these days. Is there anything that man can’t do? I’ve never actually seen him plumb in a washer dryer, but I reckon he’s good for it. We’ll be Laishing and I’ll be moonlighting with Sons of Noel and Shoreline. Looking forward to it greatly. Redwood Red (our Cathy’s band, me and Marcus of all the bands) is playing at the Westhill Hall on Saturday at another exciting alldayer headlined by the rather excellent Diane Cluck. In other news, I have created a Bandcamp account to nicely stream our music. I felt that my working day needed yet another account to log into. I’ve also fiddled about with our myspace account and made it look like the sort of site you’d expect to browse for a Thai bride. What else? 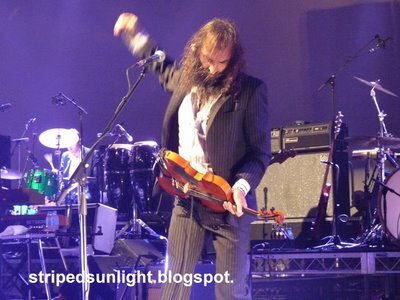 I met Warren Ellis in town yesterday. I don’t know him. I just slowed down on my bike, shook his hand and welcomed him to Hove. He was graceful. If you don’t know who he is then find out. He looks like this. Oh and I found this video of me singing a Bonnie Prince Billy song ‘Ease Down the Road’ in Germany. I like the noise Tom makes right at the start. I couldn’t see a thai bride. Will be saving my pennies for the album instead!